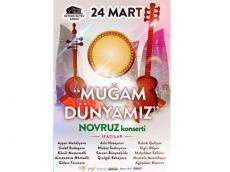 Heydar Aliyev Palace will host a concert timed to Novruz holiday on March 24. The concert titled " Our World of Mugham" will bring together winners of international contests Ayshan Mehdiyev, Sarkhan Bunyadzade, Konul Mammadli, Ariz Huseynov, Nisbet Sadreyeva, Babek Guliyev, Sadaf Budaqova, Elgiz Aliyev, Almakhanim Ahmadli, Mahabbat Safarov, Gizilgul Babayeva, Mustafa Mustafayev, Gulzar Farajeva, Agashukur Nasirov and others, Trend Life reported. Ticket price is 10-40 AZN ( $ 6-24). Tickets can be purchased at all city ticket offices, ASAN Service Centers, Ganjlik Mall and 28 Mall, online at www.iticket.az.